Truth is, I have never been much of an envelope-pusher. When the chips tumble in the wrong direction, I take refuge in genre. And to me, as a fan of classic filmmakers like Howard Hawks and John Ford or modern ones such as Michael Mann, nothing gives me more pleasure than a well-crafted genre piece. It’s a critical weakness, I know. And strangely, I am more forgiving of it with film than I am with literature. I can’t remember the last time I read an airport potboiler, but I’ll defend a film that never breaks convention to the last breath. The trick is, naturally, smarts. Polanski can make Chinatown or Frantic and give a new spin on Hammett and Hitchcock. Eastwood can update the western with Unforgiven. Tarantino can take a World War II film in a new direction with Inglourious Basterds. It’s like a cover of a pop song. The interpretation is the attraction; the artist filtering the material through his or her own sensibilities. I have probably always found that more interesting than the avant-guardians who are the true pioneers. I won’t succumb to electronic music, splatters on a canvas , or Joycian narratives. But again, that’s my problem. 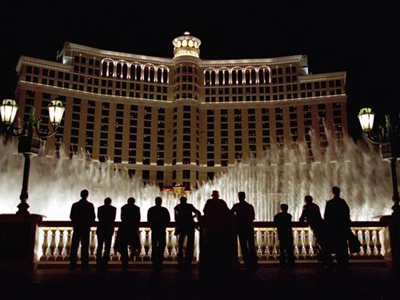 And this might like a rationalization as much as anything, but that explains, if not necessarily justifies, my appreciation of Steven Soderbergh’s crowd-pleasing Ocean’s Eleven franchise. To be clear, I’m a fan of the first two and remain completely ambivalent toward the third film, which struck no chord with me the one time I saw it (despite the presence of the inspiration of the blog, Mr. Pacino.) That film truly reeked of an exhausted premise, where the franchise finally caved into the sort of movie-star mugging that had loomed as an existential threat all along. But the first two basically trace Hollywood history from the 30s to the 60s, when a student of film such as Soderbergh astutely recognized that his big-studio backing would allow him to celebrate and subvert genre at the same time, as any postmodern film student would. Eleven is as grand a celebration of Hollywood Classicism as has recently existed. Indeed, Hawks would have adored the film, one in which a group of smart professionals gather together to attain a masculine objective while the hero (George Clooney) is preoccupied with the one woman (Julia Roberts) he considers his true equal. Clooney and Roberts drip royalty in a way that I understand many critics found alienating, but to me remains reassuring in an age when the digital democracy guarantees every strongly motivated attention-seeker, regardless of innate talent, some moment in the sun independent of moxie. We should still be grading on a curve, and if we would like Clooney and Roberts to be comfortable as the inheritors of the grand tradition, then we should help them along the way. The tragedy, in fact, is that they never took their natural pairing to a vehicle that gave them ample room to run. (Roberts, instead made The Mexican with Brad Pitt, another Eleven star. Remember that? Of course you don’t.) You could draw a straight line from their exchange in a hotel restaurant to Bogart and Bacall and the picture would have benefitted from more of it. They’re old now, Clooney and Roberts and Pitt. And already, we’re struggling to figure out who can hold that spotlight. The story of American film is the tale of the up and comer supplanting the wizened ace, but as is typical of any observer falling victim to the ravages of time, it’s hard for me to see the immediate successors. But that’s natural, as I’m of their generation. But Eleven is an absolute master class in studio filmmaking, with Soderbergh infusing his touch so that the vibe never comes off as spoiled (as in the Sinatra source material) but practiced. This film is a veteran’s workout, and it’s still a total delight to see not just Clooney and Pitt, but professionals such as Andy Garcia, Elliot Gould, and Carl Reiner summon their game, while allowing in scene stealers such as Bernie Mac. Given my strident defense of Eleven, you might be surprised to discover that I am more likely to pop in Twelve into the player. It was with Twelve that Soderbergh truly gave into his influences (See also, the sadly overlooked The Limey)—60s cinema. The old art films. The European masters. Knowing the American hostility to the Continent in the first half of the aughts, Soderberg nevertheless produced a studio film that was shot entirely on his own terms. It was derided in some circles as an ego-driven romp—and yes, there are times when it feels that way; the comic dialogue isn’t very good—and the Hawksian ensemble feel of the first has vaporized (on purpose) in favor of a more French, even existential, dynamic (Does intricate planning even matter anymore? 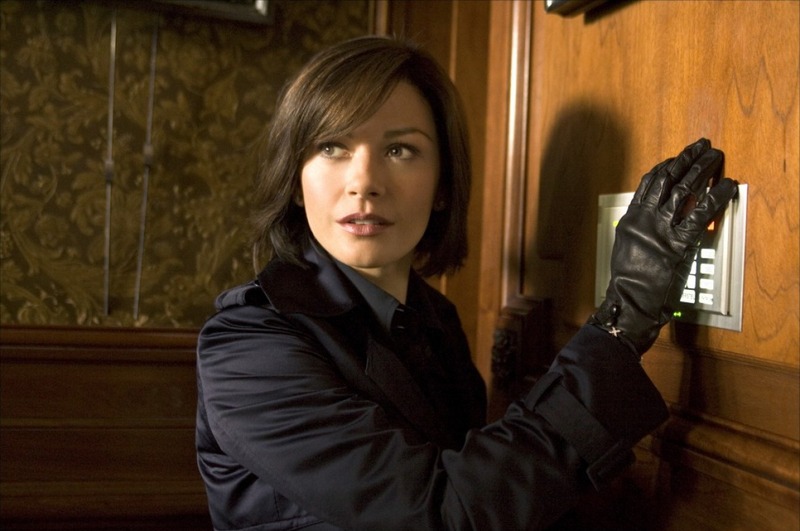 ), but the payoff is Catherine Zeta-Jones as the femme (in a tight leather jacket) and Pitt as the homme. With Albert Finney waiting in the wings. Getting back to the restrictions of genre: The conventional wisdom holds that Twelve is not a good film. It has far too many narrative problems (and the episode with Julia and Bruce Willis almost sinks the film before Cherry Jones saves it), but its playfulness with time, with narrative, with music (with an absolutely fantastic, madly inventive score by David Holmes) elevates it from a straight heist film into something more abstract and enjoyable. The lack of a coherent plot becomes the point—and Old Hollywood and New Europe share a moment. And Soderbergh proves, yet again, that he gets it. But it’s the only film of the franchise that elevates love over money. No one would, or should, confuse either film with reality. And nobody’s indie film jones will be satisfied by this unapologetically corporate product. But Hollywood used to effortlessly provide viewers with idealized versions of themselves. These days, that’s harder, whether it’s because a lack of starpower, or the tyranny of an effect-driven presentation, or a shift in cultural interests. It’s exceedingly rare for a filmmaker as talented as Soderbergh to devote himself to pleasing crowds—and we should celebrate what he did with this two films for the accomplishments they are. This entry was posted in Chemistry Sets, Movies We Can't Turn Off by James Oliphant. Bookmark the permalink.